Smaller passerines appear to have richer songs. Those blessed with a particularly fine voice are blesséd indeed. The repeated phrases of the Song Thrush (Turdus philomelos) are an example of this, offering an enigmatic and persuasive presence in woodland, particularly on a fine evening, and suggestive that their voice is compelled by joy as much as necessity. This work is in a larger ikon form than others I have painted. 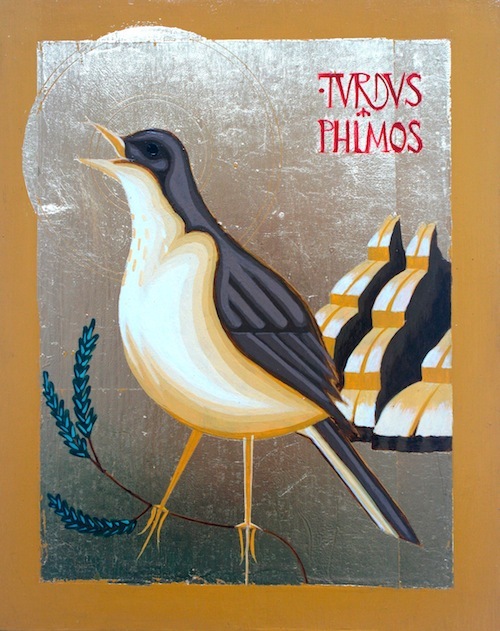 The thrush is perched on a branch of The Oak of Mamre, having emerged from the darkness of the cave to sing at the first light of dawn.